Boy, being a punk teen sure is a blast! It's like, who cares what country the Vietnam War took place in, right? Not me, that's for sure. I only care about information on the final Sunset Overdrive DLC and increasing Tom Delonge's net worth! Though you can only find information on the latter issue at my personal vlog site, "yourealreadyabillionaireinsidemyhead.org", we here at Co-optimus can fill you in on the former right now! The Xbox One exclusive's finally DLC is due out April 1st and allows the player to finally take the fight to Fizzco and their ornery robots. You won't be going it vanilla-style, though, as two new amps and two new traps are coming with the content pack to help you along the way. Watch Insomniac's video below to see how they work. Admittedly, having a murderous robot dog named Boo-Boo tag along while I'm blasting fools sound like a pretty righteous time. The kids-I mean, uh, us teens-still say that, right? 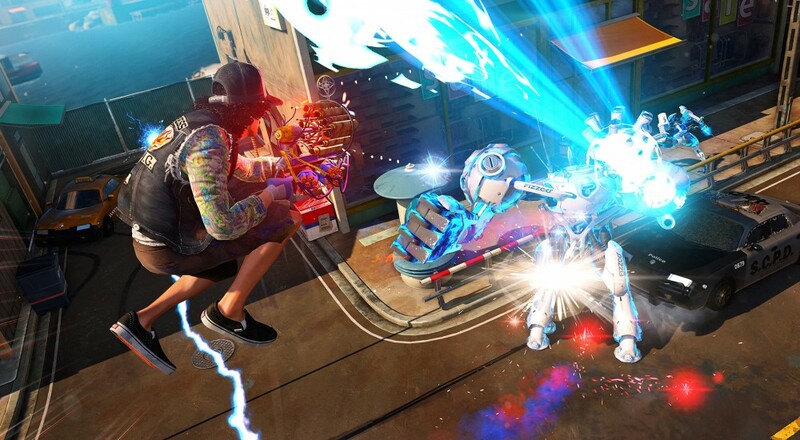 Owners of Sunset Overdrive's season pass with get this final slab of content for free upon release day. The price hasn't quite been nailed down for those without, but it's likely that it will match "The Mystery of the Mooil Rig", which is currently available at $9.99. If you haven't gotten a taste of Sunset Overdrive or its 8 player co-op mode, "Chaos Squad", check out our review and see if its culture has the right amount of counter for you.